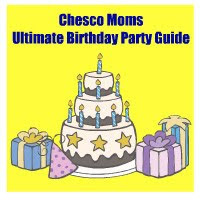 Have you checked out the Chesco Moms Birthday Party Guide? Stressed out about throwing a fabulous Birthday Party? Take a look at our Birthday Day Party Facility, Entertainment and Information Guide and stress no further! Click here to let the party planning begin!